One of our favorite parts of the Halloween holiday is decorating! We love getting creative, designing spooky seasonal accents, and planning fun parties and costumes. From creatively placed spiderwebs to bewitching decorative accents, a must-have element that can really tie the festivities together is a classic Halloween centerpiece. 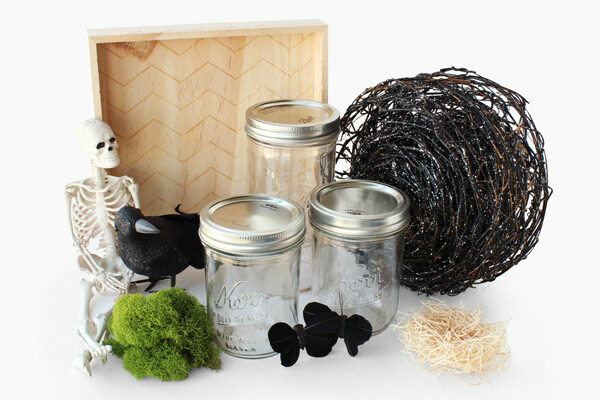 ﻿ Inspired by the mysterious look of a classic apothecary storage jar, we’ve created a Halloween party table centerpiece that is both spooky and elegant. We incorporated some of our personal Halloween décor with our favorite Paper Mart craft supplies to achieve this look. Let us show you how you can add a touch of Halloween fun to your table with a new spooky centerpiece! The key to achieving an overall eerie look is sticking to a single color and surrounding it with naturally dark elements. Keeping the color uniform and embellishing with natural, textural details add an eerie layer of depth and dimension to your Halloween centerpiece. First, fill your mason jars. An easy way to do this is to simply flip your mason jars upside down and add your décor pieces. Note: To create a naturally spooky scene, break up your vine garland and embellish with your butterfly. Alternatively, if you have a decorative element like a bird, create a nest by placing your wood excelsior at the base of your jar. Spread your moss inside your wood tray. Then, nestle your newly filled mason jars within your moss. 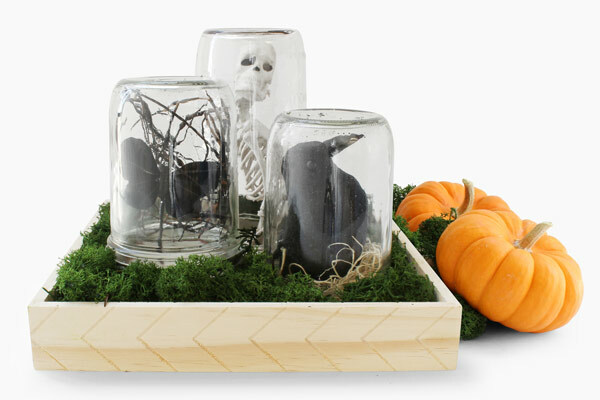 With just a few simple steps and the right materials, you can design a spooky centerpiece that will wow your guests. Loved this how-to? Are you going to create your own beautiful Halloween decoration? Show us on social using #mypapermart. For updates to our blog, Subscribe to our emails here. You’re also welcome to keep following our blog all year long for more DIY videos, tips for small businesses, product features and more!